Please list your choice of colors or theme. Like one of the samples? List it here. You can also send me an invite to match via Etsy convos. 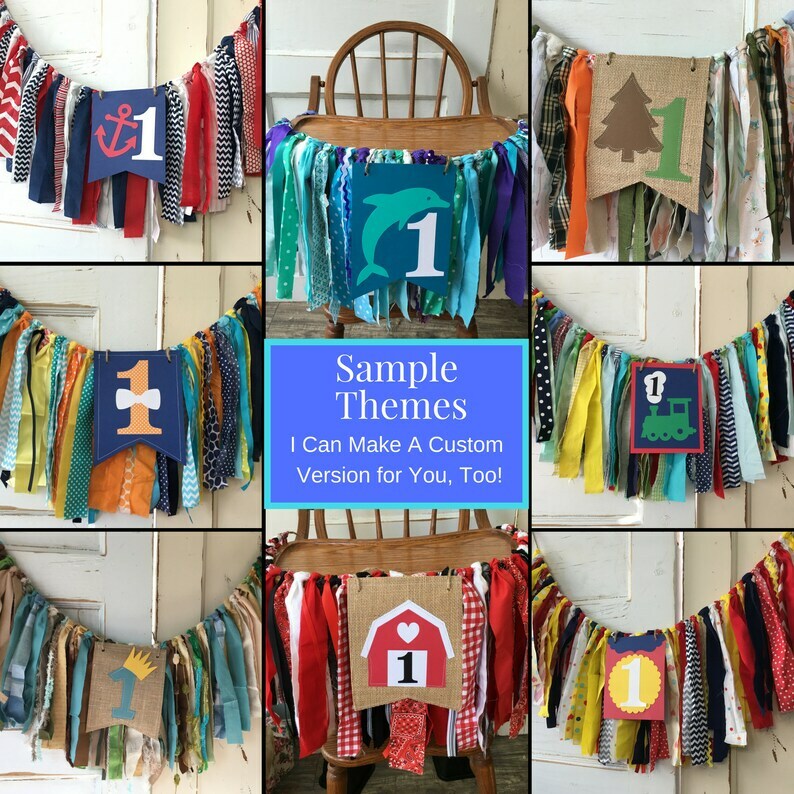 Boy's Birthday First birthday High Chair banner with Custom Front banner to match your theme. Handmade in ANY colors YOU choose. Custom boys birthday party decoration. Simply tie it to your little man's high chair for the perfect birthday accent. You can also use this for your first birthday photos or smash cake photo shoot. FREE shipping to U.S. in approx. 2 weeks. Rush orders available. Handmade with care in my smoke-free home QuiltedCupcake studio. High Chair Banner measures approximately 3 feet wide to fit high chair and each fabric strip is approx. 12 inches long. Fits standard High Chair Trays. Samples shown in listing. I can make high chair banners to fit any theme. Examples include Rainbow, carnival, superhero,cars, trucks, construction, little man, fishing, hunting, Paw Patrol, first birthday, vintage, time flies, zoo party, farm party, Wild One, jungle party, etc. Custom banner for "1" accent. Choose your colors and theme by adding PERSONALIZATION at checkout. Or, I can create a custom order listing just for you. Boys high chair banner is fully assembled and ready to use right out of the box - no assembling or printing. Ships via Priority Mail in 14 days. Need it sooner? Just contact me to discuss rush orders. I'll do my best to accommodate your request. 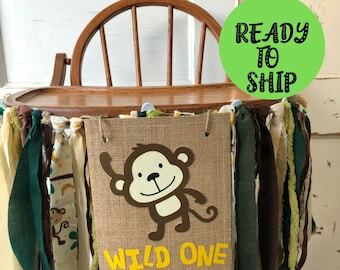 Listing includes: 1 Fabric High Chair Banner (approx. 36 inches long) and front banner with "1" . Coordinating items shown in photos are also available in my shop. Please contact me for party package quotes. Love love love! Quality was great and looked amazing. First Birthday Banner. Boys High Chair Decoration, Smash Cake Birthday Party Decor. YOU Choose the Colors. Custom MADE to fit YOUR theme.